WEEKEND DEAL - BOOK 2 NIGHTS AND GET THE THIRD NIGHT FREE! Book Friday & Saturday night and take Thursday or Sunday FREE! Be sure to advise us at time of booking if you would like to take advantage of this awesome deal. Not available mid week. School holidays and peak times not included. Named after the large pine tree that sits outside, Pinetree Townhouse is a great holiday getaway for large family groups. 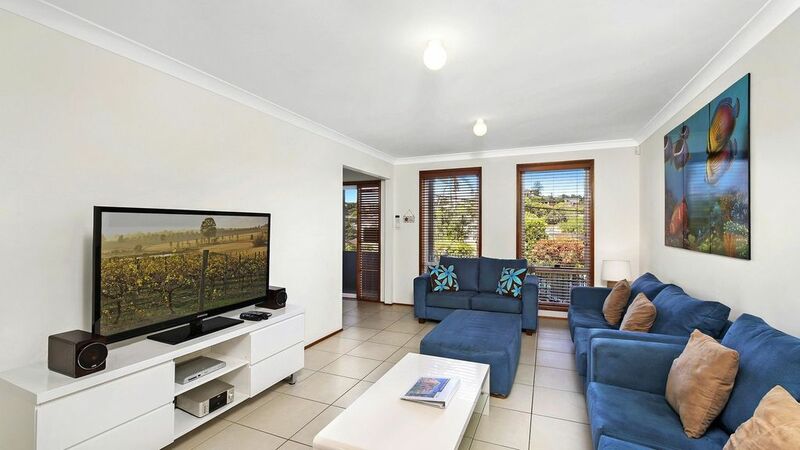 This lovely modern townhouse is just 500 metres from Terrigal beach and esplanade. Pinetree Townhouse is ideal for families and couples, offering a relaxed and cheery vibe with modern beach themed furniture. Bright natural light streams through rooms. Master bedroom with king bed, TV, walk-in robes and en suite with shower. Bedroom 2 has a queen bed, bedroom 3 has a single bed and a double bed while bedroom 4 has two bunk beds. All bedrooms contain built-in robes. Fantastic! Glad you all had a great time here... fur babies included! We were a large family and and found the accommodation spacious and very comfortable. The kitchen was well appointed and the lounge/family room suited all our needs. We were within easy walking distance of the Bowling Club (great meals), the Main Street and the beach. This house really is perfect for large and extended families, and we're glad to have housed you all during your time in Terrigal. Thanks for staying with us. Great to hear Sam! Thanks for choosing to stay with us. We enjoyed our stay at PineTree. Had plenty of space for the 6 of us & the poole table is a bonus. Nice clean fresh property. It is hard to find dog friendly holiday accommodation so to be able to bring our family dog was fabulous! Thankyou. We're only too pleased everyone enjoyed themselves! A Great place to enjoy a relaxing holiday. A great space for fun, particularly the pool table and lounge area. Was able to utilise the inside Dinning area and make use of the outside BBQ. Rooms were neat and well suited for a small group. Would definitely recommend for others and will be coming back next summer! Hi Timothy, glad you enjoyed your stay at this property. We hope to see you again soon!